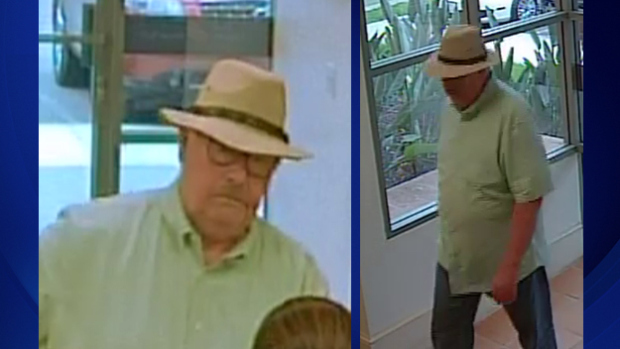 RANCHO SANTA MARGARITA, Calif. -- Deputies announced the arrest of a 70-year-old man dubbed the "Snowbird Bandit" in connection with at least five recent bank robberies in south Orange County on Thursday, according to CBS Los Angeles. According to the Orange County Sheriff's Department, Randolph Bruce Adair, of Rancho Santa Margarita, was arrested in a parking lot near his home around 12:30 p.m. on Wednesday, reports the station. Authorities said Adair is a retired Los Angeles Police Department detective. Deputies said family members of Adair contacted authorities claiming they had information about the "Snowbird Bandit" after they had seen recent media reports about the suspect. According to the station, detectives said evidence collected during a preliminary investigation connected Adair to five recent bank robberies that date back to March 20. The robberies took place at California Bank and Trust in Dana Point, First Citizens Bank in Rancho Santa Margarita, Wells Fargo Bank in Mission Viejo, U.S. Bank in Ladera Ranch and First Citizens Bank in Rancho Santa Margarita, officials said. Adair is being held on $205,000 at the Orange County Jail for robbery and an outstanding warrant, reports CBS Los Angeles. Authorities said they intend to pursue federal charges against him.